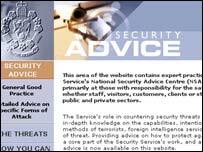 The security service MI5 decided to publish security advice on its website for the first time in April and caused quite a stir - with the site receiving 3 million hits in one day. The site publishes a top 10 list of safety tips for businesses and other organisations and lists the methods of attack most likely to be used by international terrorists, with bombings most common for al-Qaeda. The site also links to other British sites such as London Resilience and UK Resilience. The Home Office also has a website, but the advice on what to do in the event of a terrorist attack is very basic. It advises people to be prepared for any emergency in the home and to have bottles of water and a torch in the house. In the United States, there is clear advice on the steps to take in the event of an attack. The American government's special website has pages giving advice on how to make an emergency kit containing water, food, a first aid kit and clean air. It also gives advice on how to make an emergency plan for the home and in the workplace. 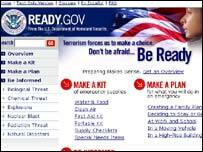 The Ready.gov website also gives advice on what might happen in the event of different types of terrorist attacks such as a chemical or biological one. In the US capital, Washington DC, there is emergency advice on what to do in the event of an attack while you are on public transport. Drawn up in conjunction with the American Red Cross, the Washington Metro and the US Homeland Security department, the site gives advice on what to do in an emergency depending on whether you are on a train, underground or a bus. In New York, there is also a public service film which is widely available containing advice on what to do in the event of a terrorist attack. Across the border in Canada, there is extensive government advice available on the internet. It is possible to download and print a detailed document which contains information and advice on what to do in emergency situations such as terrorist attacks. The document, called "Preparing for the Unexpected" also has information on bomb threats, suspicious packages and chemical, biological, radiological and nuclear (CBRN) incidents. It too contains useful information giving step-by-step advice on building a personal emergency plan, recovering from a disaster and administering basic first aid. Australia also has a very detailed "Preparing for the unexpected "website which has been created by the government's Attorney General and gives general emergency advice. The downloadable document by the Emergency Management Australia department contains information about how to prepare not just for an attack, but for many other types of emergency. 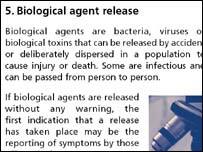 It also has advice on what to expect in the event of a chemical or biological terrorist attack and on how to cope emotionally with stressful situations. The site also contains basic first aid advice and information on making emergency plans.